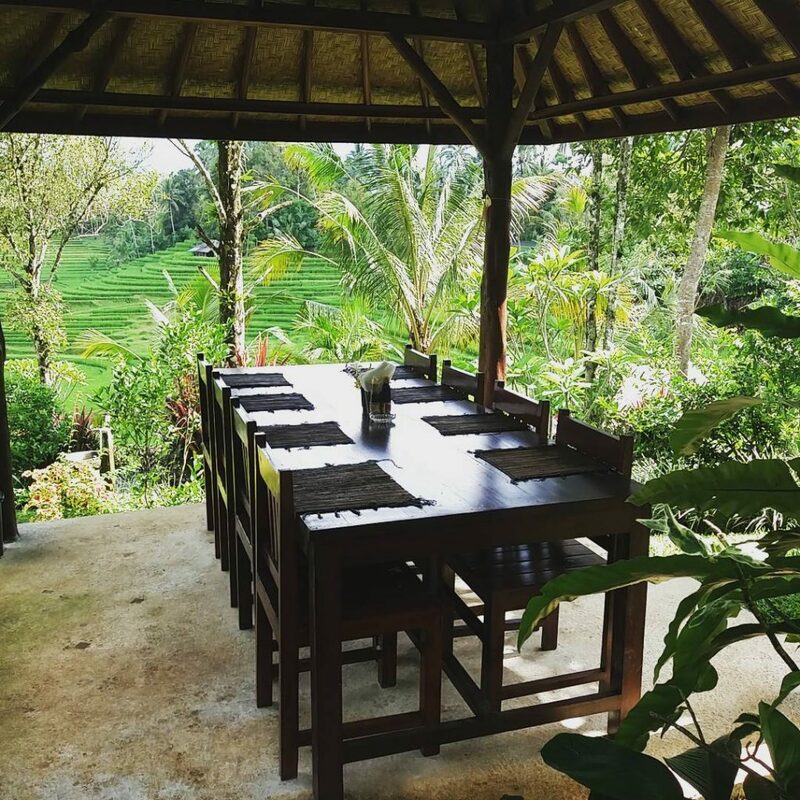 This restaurant in Ubud gives you the complete Balinese experience while you dine. Set in Nyuh Kuning village, Laka Leke Hideaway Restaurant features Balinese-style thatch-roofed pavilions in an outdoor setting surrounded by greenery. Try their buffets of local cuisine or order a la carte dishes of mixed rice, satays and signature crispy fried duck. Food items start from 27,500 Rp and buffets from 375,000 Rp. Come on Mondays and you’ll even get to watch the traditional ‘kecak’ dance and on Wednesdays, a ‘barong and kris’ dance. The restaurant is open from 9am to 11pm daily. Kopi luwak or civet coffee is a speciality in Bali. An agro-tourism location in Gianyar, Bali Pulina not only allows you to get a taste of this authentic Balinese coffee but you’ll also be able to learn how it is made. 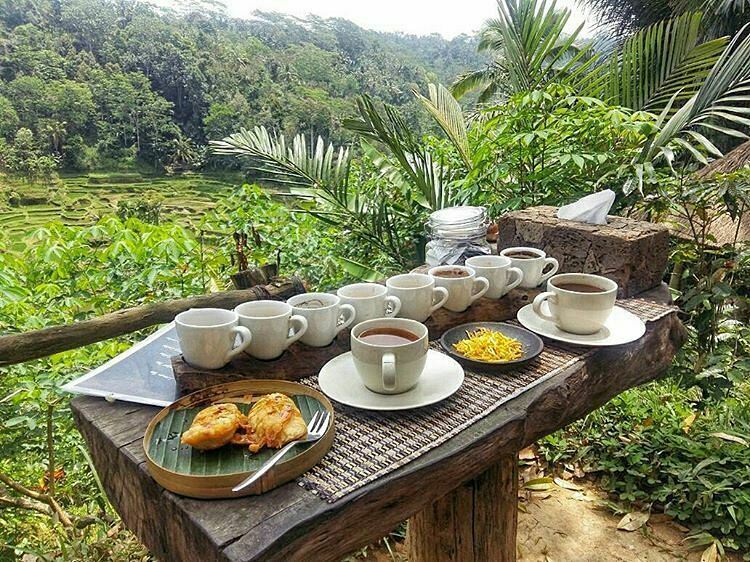 Enjoy the warm coffee and fried bananas on a bamboo deck built on a cliff with a direct view of the rice fields of Tegalalang. You can also bring home some of their famous kopi luwak sold from 400,000 Rp per 100 gram. Bali Pulina is open daily from 7am to 7pm with an admission fee of Rp 100,000 per person. 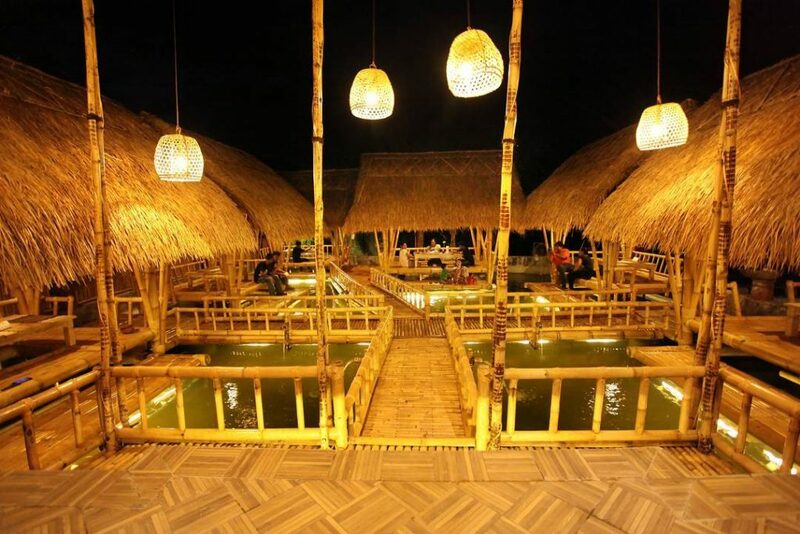 Warung Subak Pekendungan in Tanah Lot is a great place to dine for families and friends. 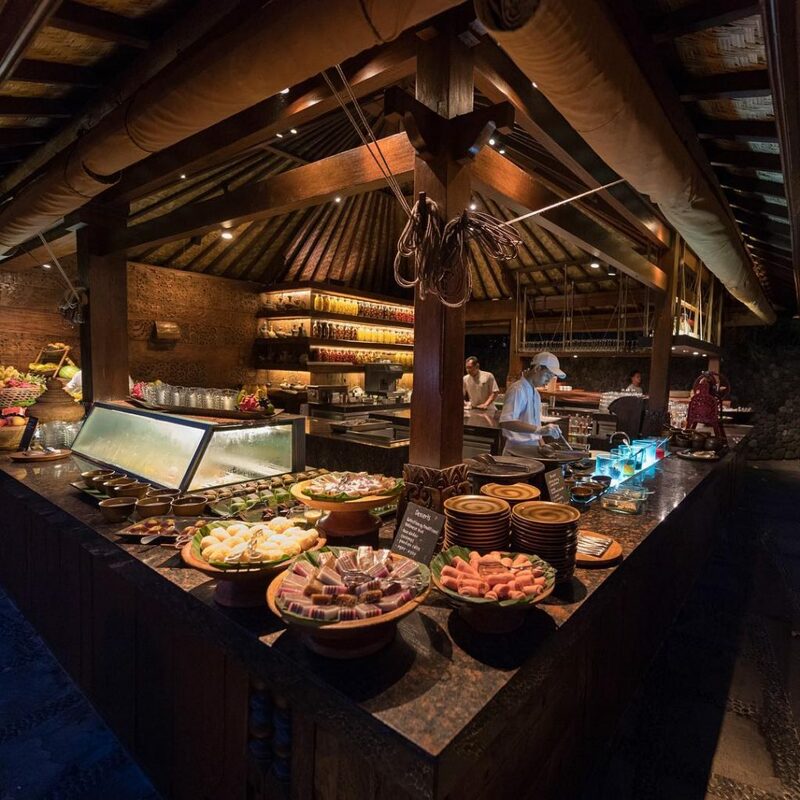 With a spacious open dining area and also traditional-styled pavilions made of bamboo, you’ll get an authentic dining experience in a unique restaurant setting. 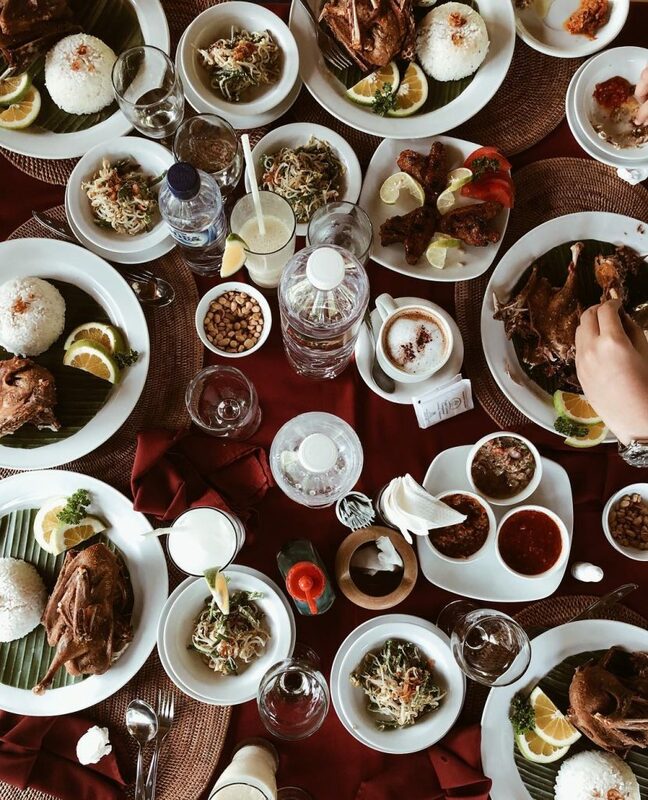 The warung offers a mix of local and Western cuisines, featuring Balinese ayam betutu and classic pork ribs. It is open daily from 9am to 8pm. With scenic views of rice terraces, Gong Jatiluwih Restaurant and Lounge allows you to feast on authentic Balinese food while taking in a gorgeous natural landscape. Sit on the deck for expansive views and try their yummy Indonesian fried rice, grilled octopus or ayam betutu. Also available is a lunch buffet from 100,000 Rp and ala carte dishes from 60,000 Rp. They also have Italian cuisines like thin crust pizza made from wood fire. The restaurant is open from 9am to 9pm daily. 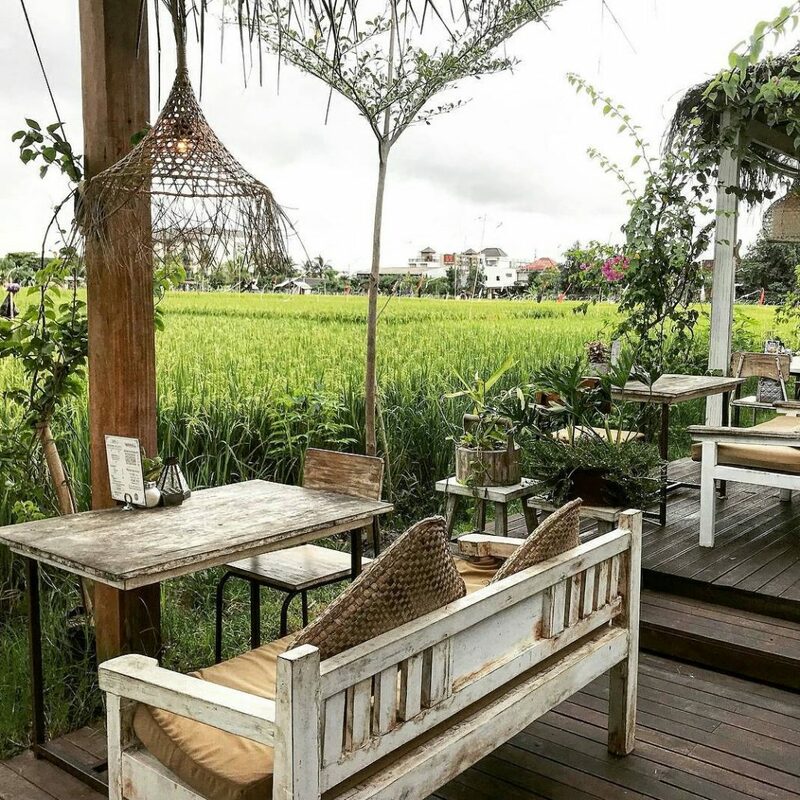 Situated along rice fields in Tabanan, Warung Tepi Sawah is a restaurant favourited by locals and visitors for its good Balinese food made from only the freshest ingredients. A family-run business, you’ll be pleased with the friendly service and affordable prices. The ayam betutu costs 60,000 Rp while their ayam bakar is 53,000 Rp. Warung Tepi Sawah is open from 9am to 9pm daily. 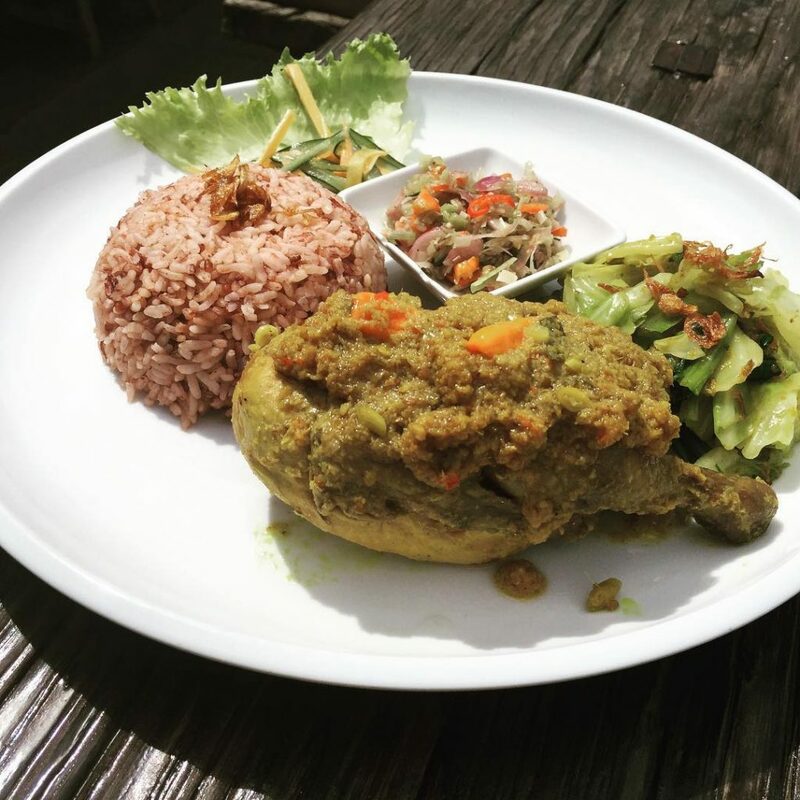 Sometimes you just want good food with good service and Warung Disini has gotten rave reviews for that. 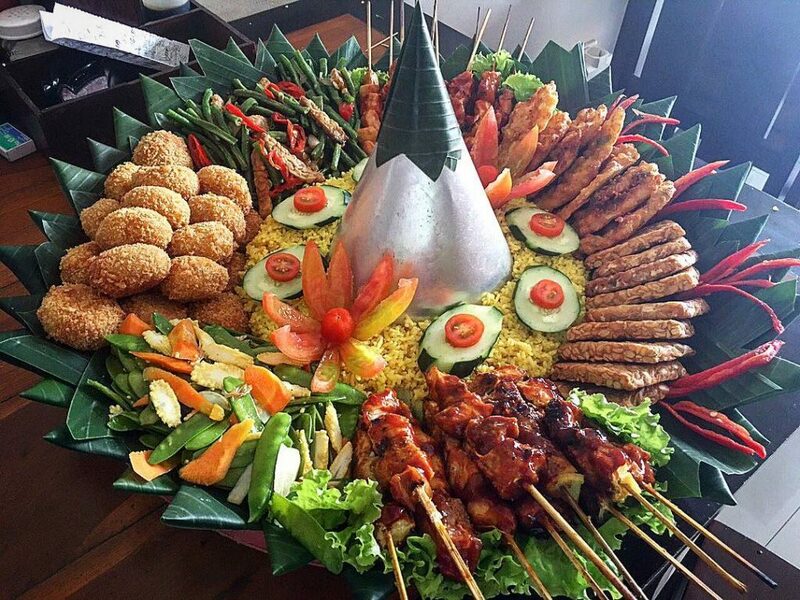 It serves is authentic Indonesian food that suits tastebuds new to Asian cuisine. They also have delicious coffee and international food options. Warung Disini is open from 7am to 10pm daily. Dine in the calm ambience of nature at Nook Bali in northern Seminyak. Here you’ll get to enjoy a blend of fusion Asian and western food with a view overlooking an expansive rice field. Try the local nasi campur, or mixed rice, with coconut water right from the husk. This pretty setting is also great for photo-taking opportunities! They are open from 8am to 11pm. 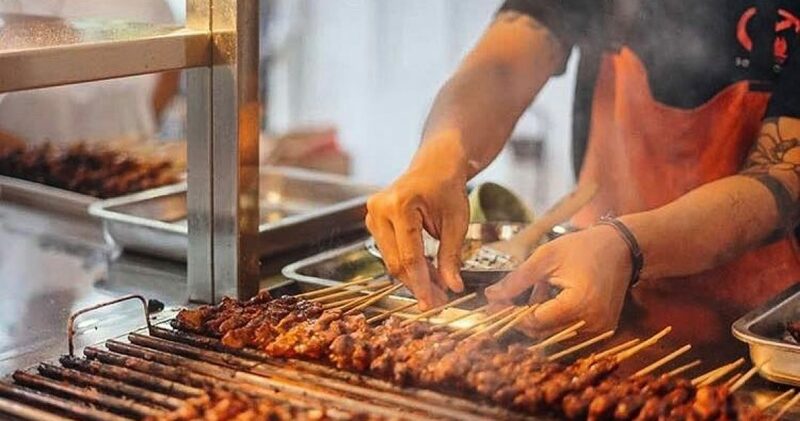 If you’re itching to taste some of the delicious foods that the locals eat, don’t forget to try sate at Gourmet Sate House which serves 12 different types of satay dishes. They only use MSG-free natural ingredients and make their own spice pastes and spices! 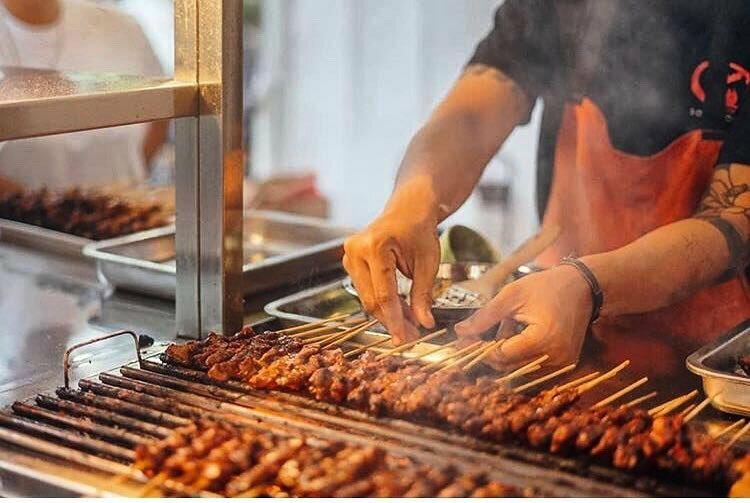 For a wide selection of Indonesian food, visit Pasar Senggol at Grand Hyatt Bali that has an elegant terrace-styled dining layout and an especially tasty Balinese grilled chicken. There is a kecak dance performance in the evening to go along with your dining experience. Pasar Senggol opens from 6.30pm to 10pm daily and the cultural show begins at 7.30pm. For the best crispy duck dish, Bebek Bengil is your go-to restaurant. Known as the makers of the original crispy duck since 1990, you can try their signature dish at any one of their 3 Bali outlets in Nusa Dua, Ubud and Jimbaran GWK. The restaurant in Ubud is open from 10am to 10.30pm. An authentic Balinese meal awaits you at Bumbu Bali. 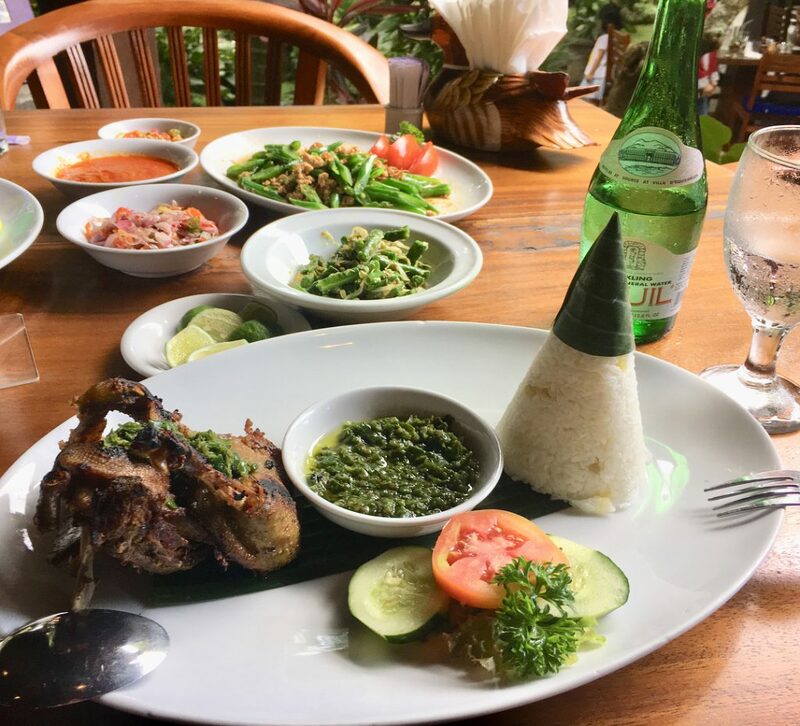 The traditional setting, together with background Balinese music, makes this restaurant a comfortable place to relax and enjoy the high-quality food sourced from the local markets daily. 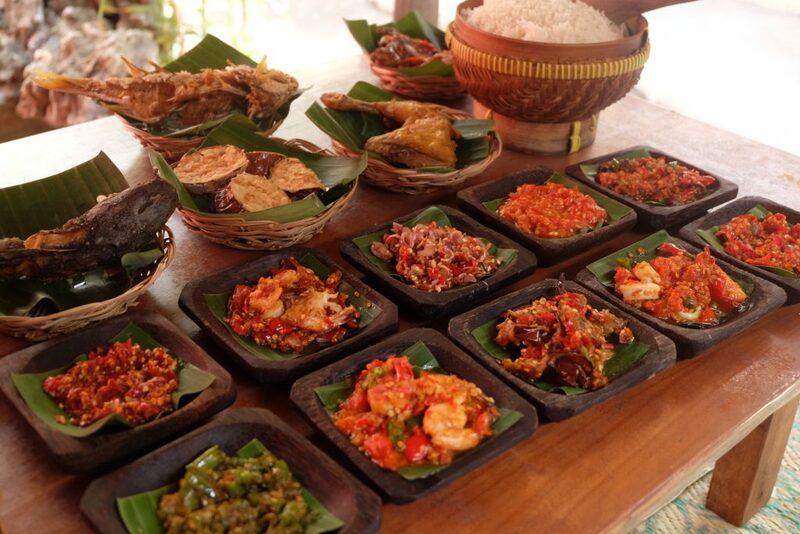 They also run classes offering an introduction to the exotic ingredients and unique culinary heritage of Bali. Bumbu Bali restaurant is open from 11am to 4pm, 6pm to 10pm daily. 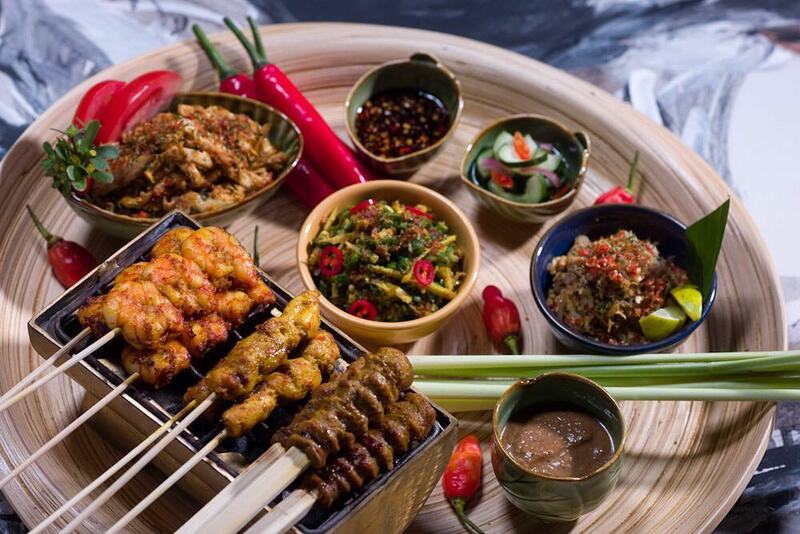 A hot local favourite, d’Sambal Nusa Dua’s menu ranges from seafood to grilled and penyet chicken. They also boasts 43 types of fresh chilli mix or sambal, which go well with their Indonesian dishes. The menu starts from 3,500 Rp and they also pack rice boxes for large groups at 27,000 Rp each. They have outlets all over Bali in Nusa Dua, Jimbaran, GWK Uluwatu and Kuta.